Although there’s a new intro to this episode, the main topic is an encore presentation from last year. Why am I playing an encore? Well, I have an exciting reason! I’m working on a brand new project for Living Homegrown and I needed to devote a couple of weeks of my full focus on it. I’ll be filling you all in as soon as I can. But rather than just stop the podcast for two weeks (I KNEW you wouldn’t want THAT), I’m running an encore of one my more popular episodes from last year. 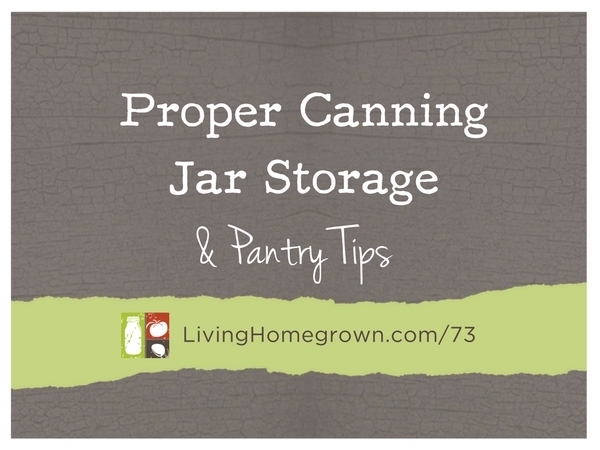 This episode is packed with valuable canning info every canner should know. Before the encore info starts, I have a BIG announcement in this episode! I have a brand new FREE webinar training for all my newbie canner listeners on November 3rd, 2016. Want to learn how to can? Just starting out?? This one is for YOU. Have you always wanted to learn but were a little afraid to start? Or have you tried canning but still feel unsure that you are doing it safely? On November 3rd, 2016 I have a brand new FREE master class for all newbies. It focuses on water bath canning and how you can get started. Great episode Theresa! Recently Southern California was on an earthquake alert. We should all have some food on hand in case of emergency. Our gardens and pantry full of home canned and dried food are a great start. May I suggest packaging our jars, so that as many survive an earthquake as possible. The old packaging with a cardboard grid inside is a good example. I make cardboard grids out of scrap cardboard and cut them to fit the cardboard or plastic box where they are stored. Priority is full jars, but empty jars can be kept that way also. Also the shelving can be secured to the wall and the jars secured on the shelf. Great suggestion Carol. I live in Los Angeles and have an extensive earthquake kit, plus shelving attached to the wall etc. But your suggestion on canning jars is very timely for people in earthquake country. Thank you.